This month a pot o’gold is brimming with free spins at Slotastic Casino. They’ve created the St Paddy’s Coin Drop, a unique St Patrick’s Day game where players can win up to 232 free spins by dragging cauldrons across the screen to catch Golden Coins and Stars. 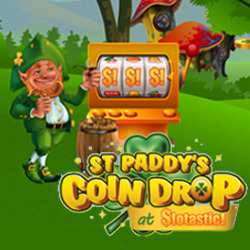 It’s free to play the St Paddy’s Coin Drop game, March 9 – April 7, 2019. Players have 30 seconds to earn as many points as they can. There are 3 levels based on the number of points collected. 1 point earns a Golden Coin, 10 points wins a Golden Star and -5 points wins Rocks. Bonus codes are unlocked at each level. The higher the level the bigger the bonus -- up to 232 free spins. Each bonus can be claimed just once, but players can play as many times as they like to unlock each level’s bonus. Slotastic has hundreds of slots and table games from Realtime Gaming. The casino’s free Android App is the best way to access them on smartphones and tablets.